Arrowhead Cattle Company is quickly becoming known as your one stop "Bull Shop". 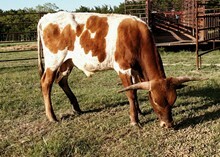 Such legendary bulls as Super Lee, RRR Jagged Edge 616, and JT Gun Runner have all come from Arrowhead Cattle Company. We search the nation for upcoming bulls and breed to the best in the business to create the kind of genetics you are looking for. RC Bootlegger is the latest and greatest of Bulls to come to Arrowhead Cattle Company. As one of the elite 80" tip to tip bulls in the industry he is proving to be one of the best producing WS Jamakizm sons on the market today.